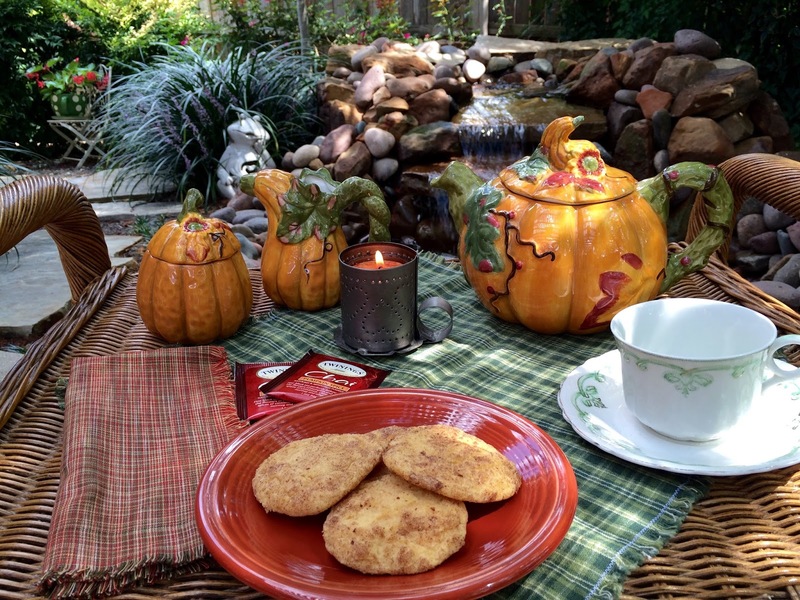 Would you care for some Pumpkin Snickerdoodles with a cup of Twinings Pumpkin Chai Tea? 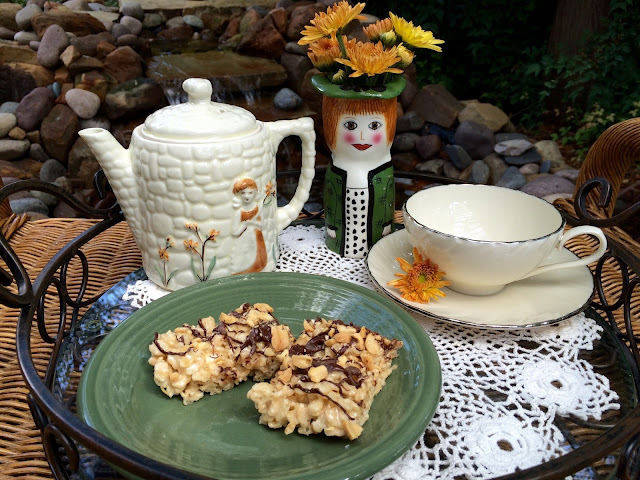 I'd love to share some with you! 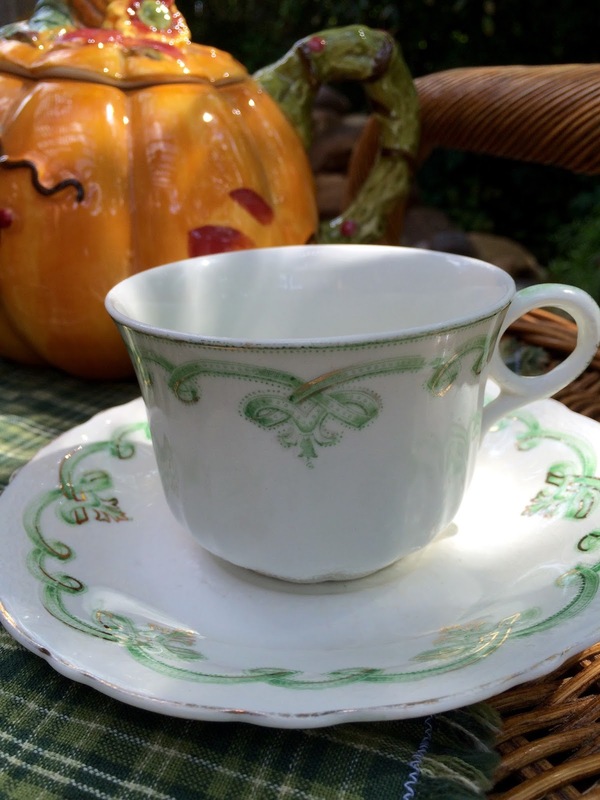 I'm using my pumpkin teapot and matching cream and sugar...such fun to use in the Fall. Even though I use this teacup that I found on Ebay, for St. Patrick's Day, I love how it blended with the green in my teapot. Mix 1 1/2 cups sugar, the butter, shortening, pumpkin and eggs in large bowl. Stir in flour, cream of tartar, baking soda and salt. Shape dough into 1 1/4-inch balls. Mix 1/4 cup sugar and the pumpkin pie spice. Roll balls in spice-sugar mixture. Place 2 inches apart on ungreased cookie sheet ( I used parchment lined sheets. I just wanted to show you how pretty my Mandevilla vine is, from the back of my fence. 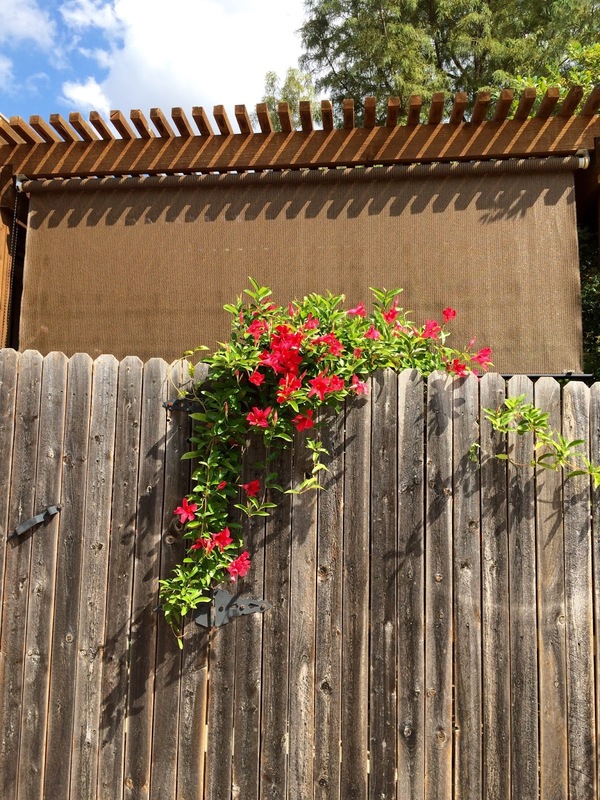 My youngest son hung the roll-up shade and attached it to the top of pergola, a couple of years ago. It keeps my patio shaded from the western sun and keeps the area cooler. Wasn't that so nice of him? Yea! Fall has arrived and it's a wonderful time of the year to enjoy the outdoors and all the scents and flavors of the season. 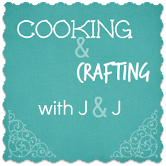 I happily bought a bouquet of flowers at Trader Joe's and after reading Michael Lee's inspirational post on oregano, which can be found here , I decided to whip up a recipe, using this flavorful herb. My pot of oregano has been a wonderful, fragrant, prolific perennial for several years now. 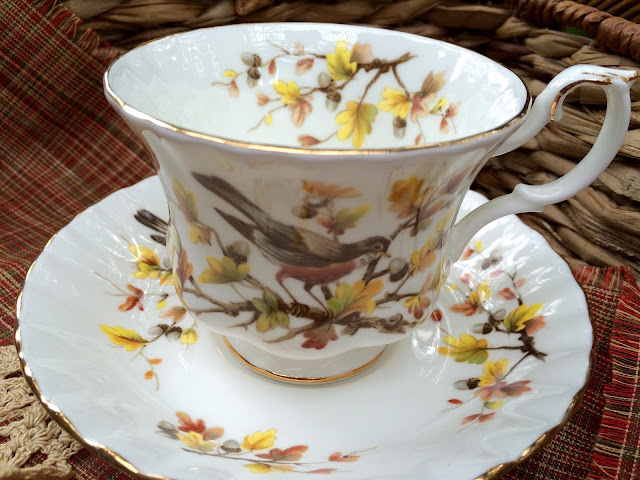 This pretty teacup which has a robin, acorns and fall leaves, was given to me by my friend Rosie, from her late Mother's collection. I've been saving it for my Fall teas. The pattern is Woodland Series, Robin, by Royal Albert. 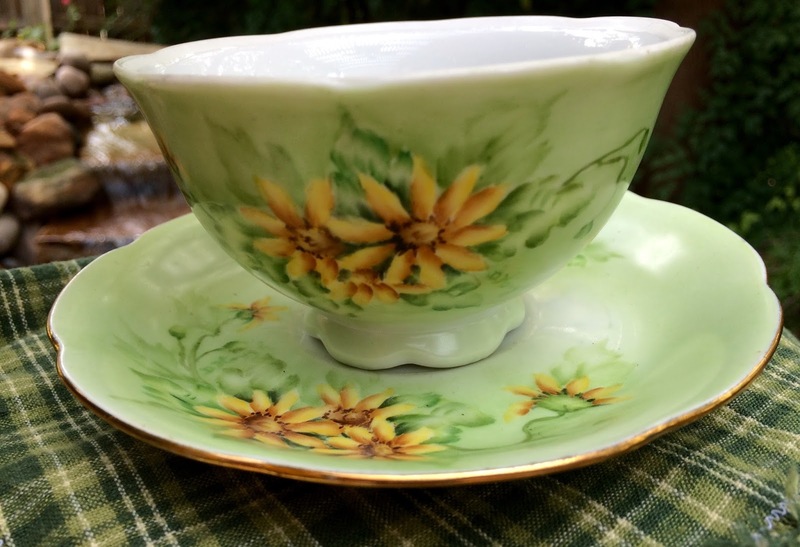 Please excuse the glare, but don't you just love the pretty saucer, and also the sprig of fall leaves that are inside the cup? This crustless quiche recipe was given to me from my friend, Bea, who got the recipe from our friend, Claudia. 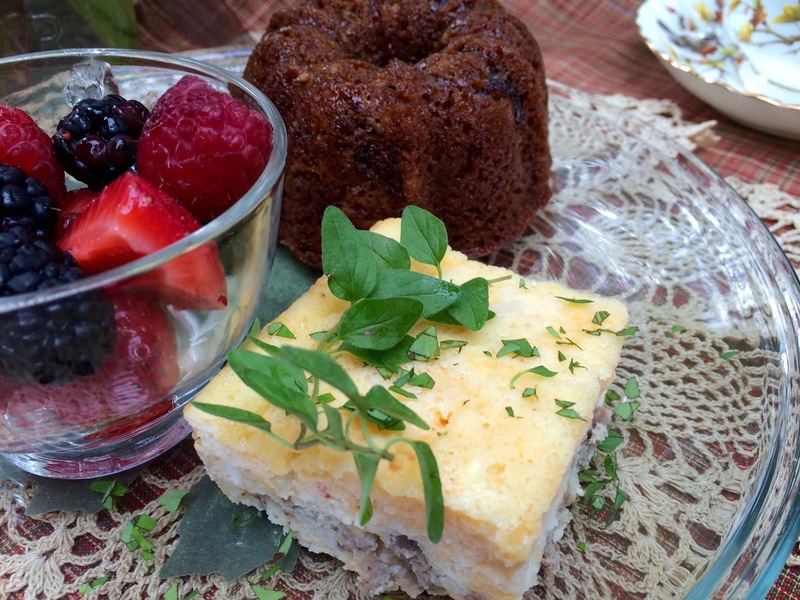 It makes a large amount and would be perfect for a brunch. What I do is, after it cools, I cut it into about 20 pieces and freeze the pieces on a parchment lined cookie sheet. When frozen, I transfer them to freezer proof bags. I will take out a few to use during the week and I then heat the individual piece in the microwave for 40 seconds and have it for breakfast. This sure saves me time in the mornings and gives me my protein! Melt butter in small saucepan, add flour and cook until smooth. Beat eggs, add milk, cheeses, baking powder, salt, butter-flour mixture and fresh or dried herbs, if using. Grease a 9x13x2" baking dish. Add the cooked, crumbled sausage to the bottom of the dish. Pour the egg mixture on top and bake uncovered at 350 degrees for 45 minutes. 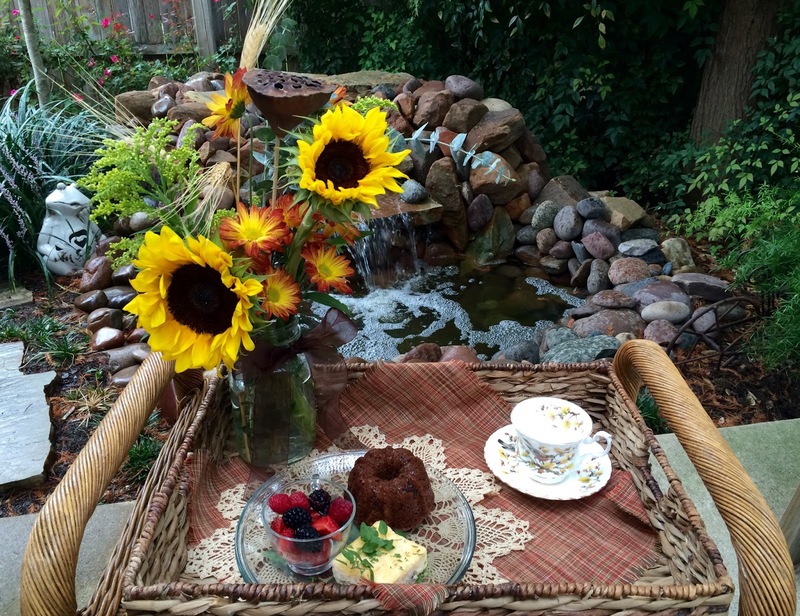 We finally have some cooler temperatures in Texas and it's a joy to be outside for tea! Please join me for some yummy treats. I've used my lady vase and filled her "hat" with some pretty mums. 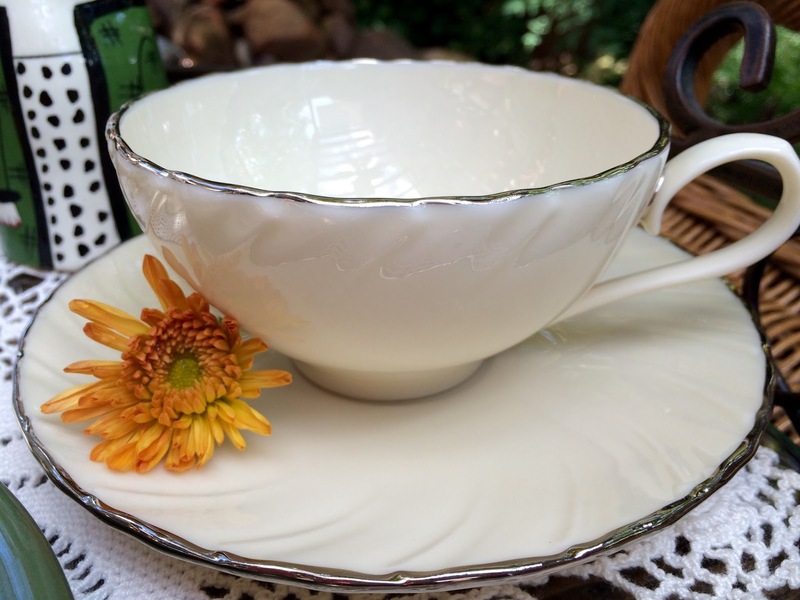 This lovely cream colored teacup was from my friend Debbie, who is Stephanie's mom, from Stephanie's first teacup exchange at the The Enchanting Rose. I think of Debbie every time I use this Lenox teacup as it goes with anything, and it looks so pretty with my cottage girl teapot that my mom found from a thrift shop and gave to me. I found the recipe for these grown-up marshmallow treats from the Parade magazine supplement from the Dallas Morning News. 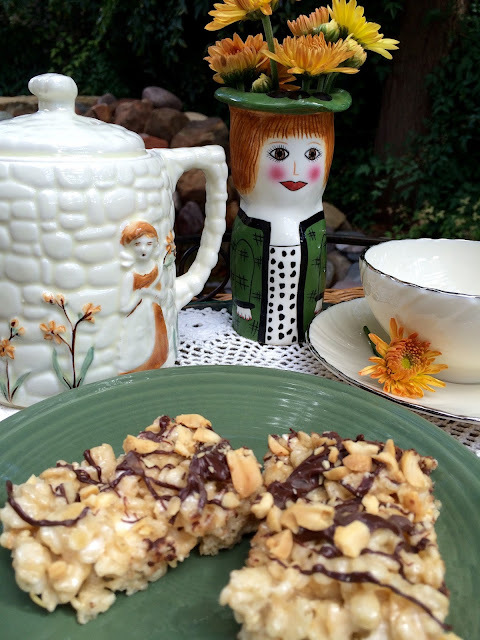 The recipe is from Stephanie Banya's cookbook Treat: 50 Recipes for No-Bake Marshmallow Treats. 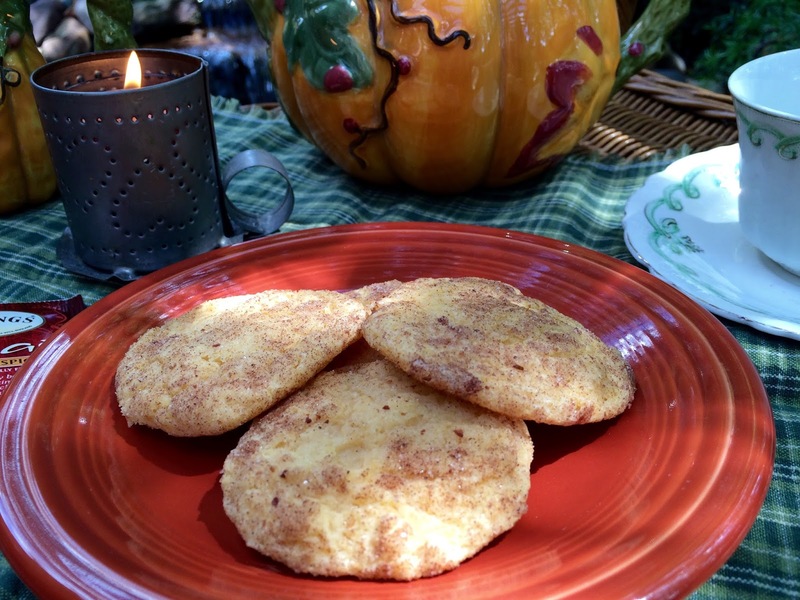 They make for an easy Fall treat! Grease bottom and sides of a 13 x 9" baking dish with 1 Tablespoon butter. Melt remaining 5 tablespoons butter over medium heat. Add marshmallows, reduce heat to low, cover and let stand 3-5 minutes or until marshmallows soften. Add 1/4 cup caramel sauce, vanilla, and salt; stir until smooth. Fold in cereal. Spread mixture into prepared dish; spread evenly with a piece of waxed paper. Drizzle with chocolate and remaining 2 Tablespoons caramel; top with peanuts. Let stand 15 minutes (mine took longer!) or until firm. 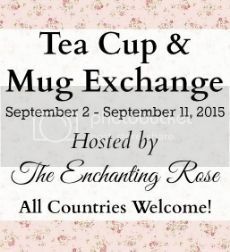 Please join me for a labor-less treat for Labor Day! I can't get enough of cheery sunflowers and this bouquet from Costco provided me with enough flowers to spread around the house. 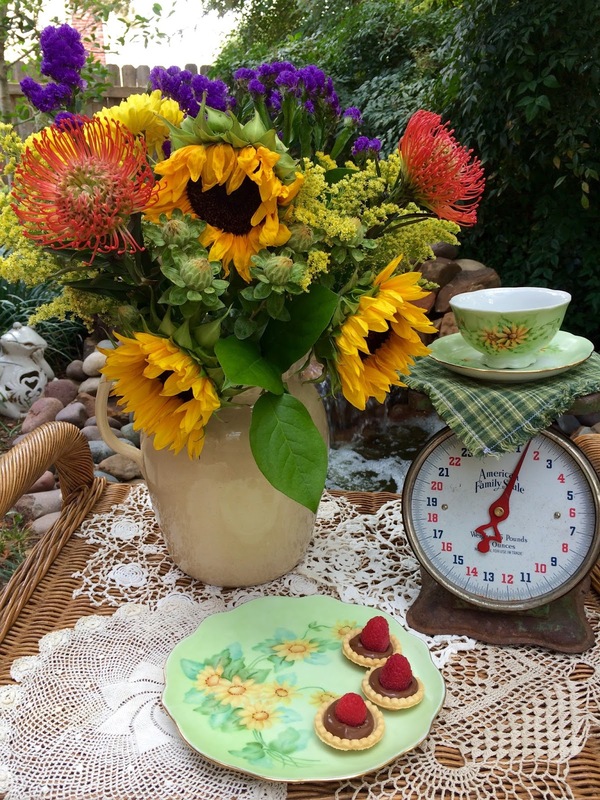 I'm using another of my painted teacups and matching plates from my late Great Aunt Kitty. These yummy treats were inspired by Janet at Rosemary and Thyme, and you can check out her beautiful pastries here. 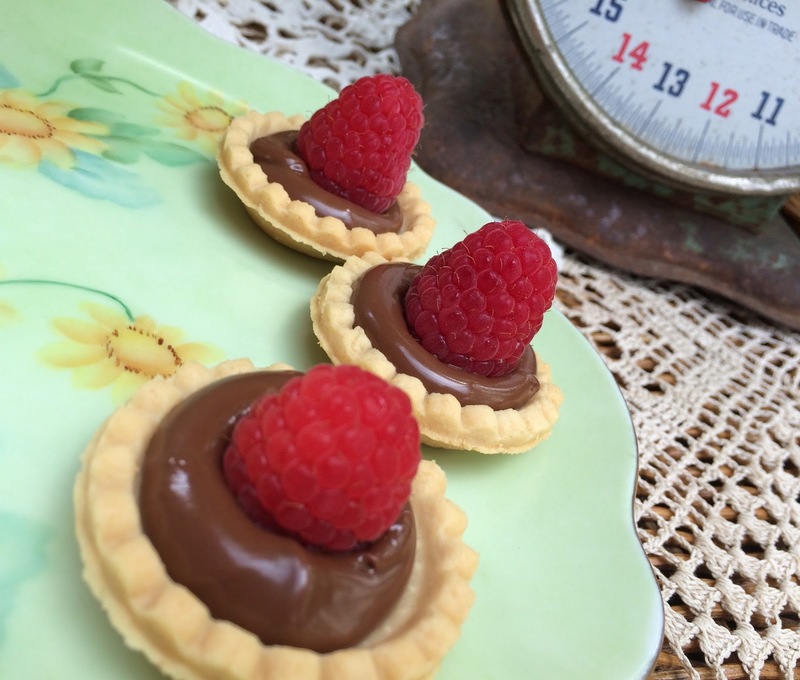 Janet used mason jar lids and rims to place her pastry into and then baked them, and then filled them with chocolate hazelnut spread. 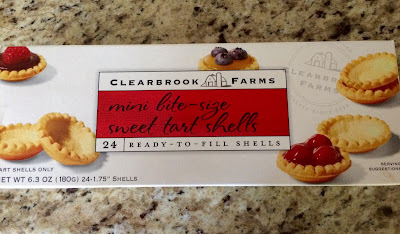 I had a box of mini tart shells in my pantry that I had bought awhile back from HomeGoods and used them. All you do is fill the shells with some chocolate hazelnut spread (Nutella) and top with a raspberry..... Easy-peasy!! This is the box of tart shells that I found, but mini tart shells can also be found in the freezer section at the grocery store. I hope that this inspired you to make a labor- less treat sometime soon.